Looking for 5 star puppy training near you? Find your location! Getting a new puppy is an experience comprised of equal parts joy and exhaustion. Each puppy comes with unique quirks, which can be challenging—especially for first-time dog owners. If you are planning to get a dog, or have encountered training issues with your brand-new puppy, All Dogs Unleashed, can help establish preventive training as well as provide problem-solving new puppy training. Because dogs have a strong social drive, a willingness to please, and the intelligence to learn quickly, dogs have rightfully earned their place as humankind’s best friend in the animal kingdom. 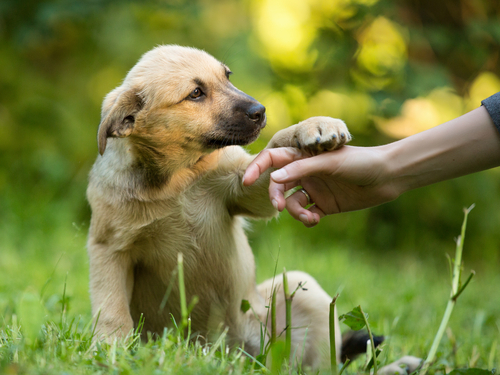 One of the few animals who recognizes and responds to the human finger-point, one might assume that training a dog would be intuitive and simple. However well humans may get along with their canine companions, the truth is that there is quite a large culture gap between you and your new puppy. Despite his willingness to please, your little one needs to 1) understand what you want, 2) resist his natural impulses calling him to “misbehave” and 3) decide that what YOU want is more worth pursuing than what HE wants to do. After all, it’s the poor employer who doesn’t make sure an employee understands expectations and knows how well he’s being compensated for his time. All Dogs Unleashed can help you establish a relationship with your dog that is based on mutual understanding, respect, and ultimately your authority as your dog’s rightful protector. Now, even if you have been very successful at training your puppy to obey YOU, how well does your friend obey other family members who come to visit? Friends? Staff at doggy daycare or the grooming facility? In order for your canine companion to be able to move freely in the world and be a welcome addition anywhere dogs are welcome, it is your responsibility to engage in training practices that ensure that your dog will behave at all times and for anyone—from the vet to the mail carrier—who will be in his presence. While we won’t make your dog less effective at alarming you to intruders or protecting your home, powerful dogs especially must learn how to be impeccably behaved canine citizens. As the owner of such a dog, it’s equally important that you engage in training to learn how to be the ideal leader for your beloved puppy. We cater our training to each individual dog’s quirks, but across the board we use positive reinforcement techniques. We keep a three-pronged focus on working with your dog through direction, attention, and stimulation during our two-week, immersive experience. Our techniques create a new framework in your dog’s mind to accommodate the commands you’ll use together. Once we’ve trained both you and your new puppy, you will be able to work with him on any types of commands you desire, from basic obedience to agility and fun tricks! Even if you’ve had a tough start, fear not. The companion of your dreams will soon become a reality after dog training dallas with All Dogs Unleashed. Advanced K9 Training in Fort Worth: We Get Results!